For me, Twitterrific has always been synonymous with using Twitter. I used it first on the Mac in March 2008. I even downloaded the app first, then signed up for Twitter to use it! And Twitterrific was the first app I installed from the App Store on iOS when it launched in July 2008. I tried a couple other clients when they came around, namely Tweetie and Tweetbot, but Twitterrific’s unified timeline always brought me back to the nest. For the past several years, the Mac version has fallen by the wayside, and I got used to only using Twitterrific on iOS. Then, earlier this year, the Iconfactory set up a Kickstarter to resurrect Twitterrific for Mac as a fresh, modern client. I couldn’t sign up fast enough. The campaign was successful, and all summer I have been enjoying the weekly beta releases as the new Twitterrific took shape. 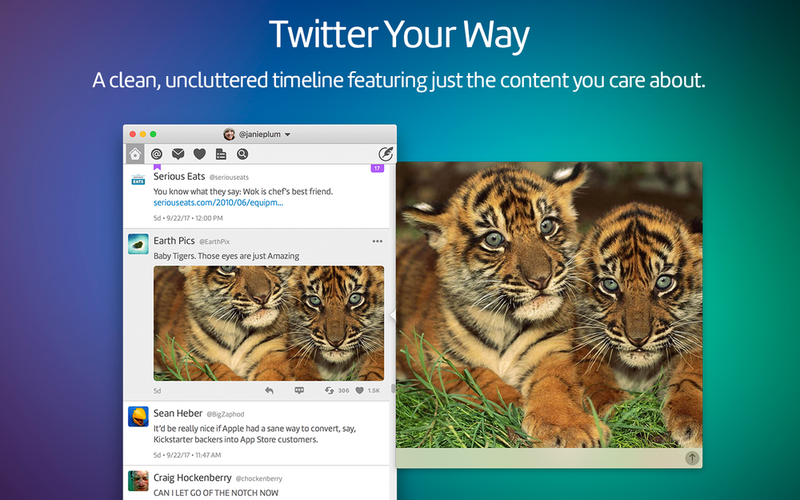 Today, Twitterrific 5.0 for macOS is available for everyone on the Mac App Store. It packs a ton of features into the new app, stays in sync with the iOS versions using iCloud, has fantastic keyboard and accessibility support, delightful sounds, and a few nostalgic Easter eggs from past incarnations. Beyond any feature, though, is the care that the folks at the Iconfactory put into Twitterrific. It is clearly a labor of love, and the people behind it are genuinely fantastic. I suggest you follow a few of them on Twitter, and say hi. The best part about the Apple community isn’t just the apps we use to change our life and work, it’s the people and friendships made along the way. In a sea of one-off money-grab apps, there are a precious few with a human story behind them. Twitterrific is one of them. And that’s why it is well worth supporting the team by purchasing Twitterrific for macOS.